Q-Mark Berko® Model SED Commercial Fan-forced wall heater generates excellent heat output using two-shaded, pole impedance protected, permanently lubricated motor and nickel chromium heating element. It offers 50 CFM of superior airflow. The heavy-gauge steel housing in northern white color, has chrome finish for effective corrosion resistance. The heater offers dual protection using thermal cutout with indicator light and one-time thermal fuse. It is power rated for 750/1000-Watts and voltage rated for 240/208-Volts. The three-piece construction and field wiring compartment facilitates installation. It supports wall/ceiling mounting. The heater is temperature rated for 45 to 90 deg F. Automatic thermal cutout with built in warning light, turns off the heater in the event of overheating. 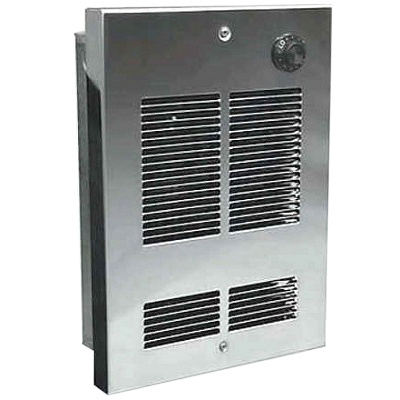 The wall heater has a dimension of 9-Inch x 2-3/8-Inch x 12-1/2-Inch. Wall heater is cETLus listed. * Inventory displayed is accurate as of 04/23/2019 07:40 PDT.